Get used to seeing these bibs because they are back with a vengeance this fall/winter, except this time in leather. Yes, LEATHER. That word alone makes me happy. Besides being worried about getting so hot and sweaty that I’ll become Ross in an episode of ‘Friends’ (you know, the one where he had to make himself a pair of ‘paste pants’ because he couldn’t pull his leather skinnies up), I am so excited about this trend! Here, I’m wearing a pair of Level99 jean overalls from Anthropologie and I’m so happy to take them into the winter months. 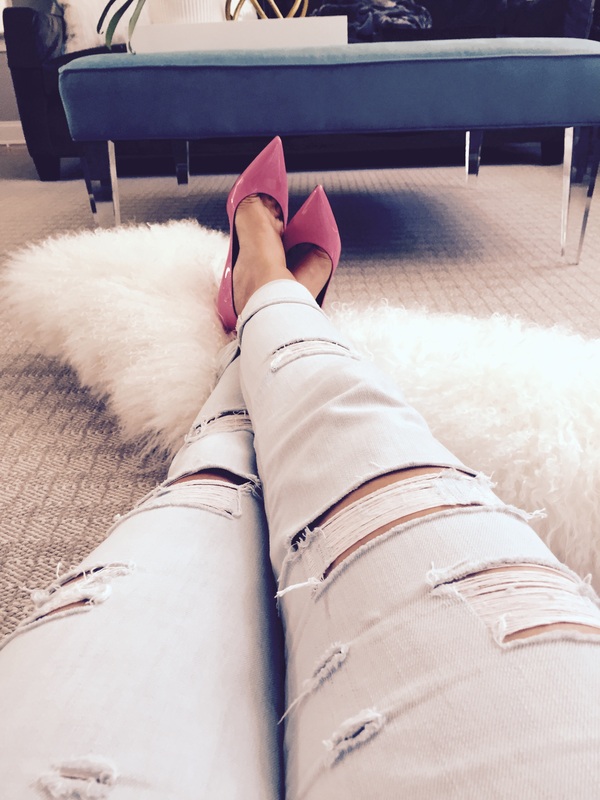 In these pictures, I added a few girly touches with pink pumps and a flowy, flower crop tank. I also bought them so they were fitted instead of loose and oversized. Still though, I can just as easily pair them with strappy flats or a pair of converse and throw on an oversized sweater cardigan to rock the trend this winter. And the good news is you can too. 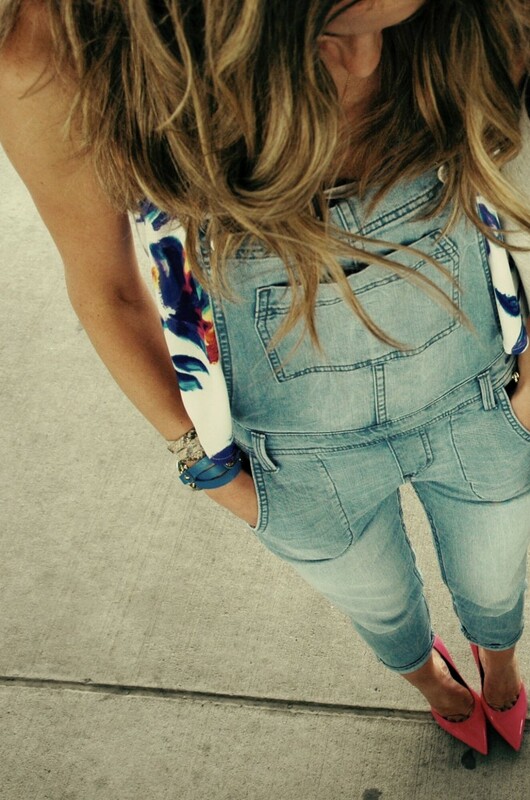 So many of you have asked, ‘can I really wear overalls?’ and the answer is emphatically yes, you can! Find a pair which flatter your body type and go for it. Decide if you want a more casual, loose fit or a more refined, fitted pair. Most importantly, OWN IT! Just have fun with fashion, be adventurous with your choices and be confident. It’s amazing what a little confidence will do for the look you’re trying to pull off. If you want to go uber trendy, buy a leather pair. Just remember, if you go the leather route, choose your bathroom breaks wisely. If you happen to find yourself hot and ‘expanded’, think twice before you pull those bad boys down to your ankles! 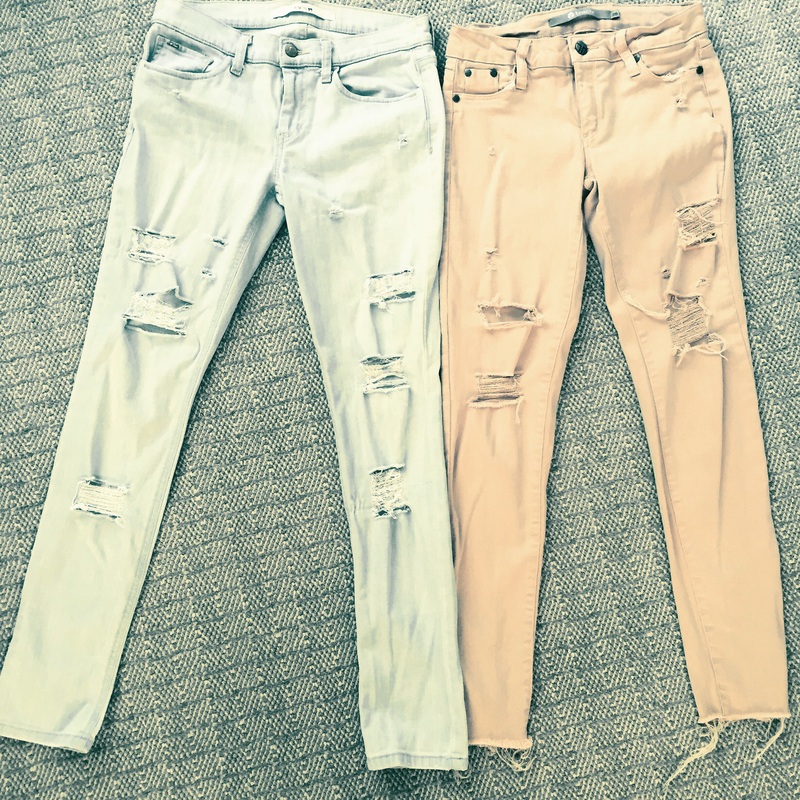 If you don’t know by now, distressed jeans are THE jean of the season (aside from the flare, which I’ll talk about in a future post). 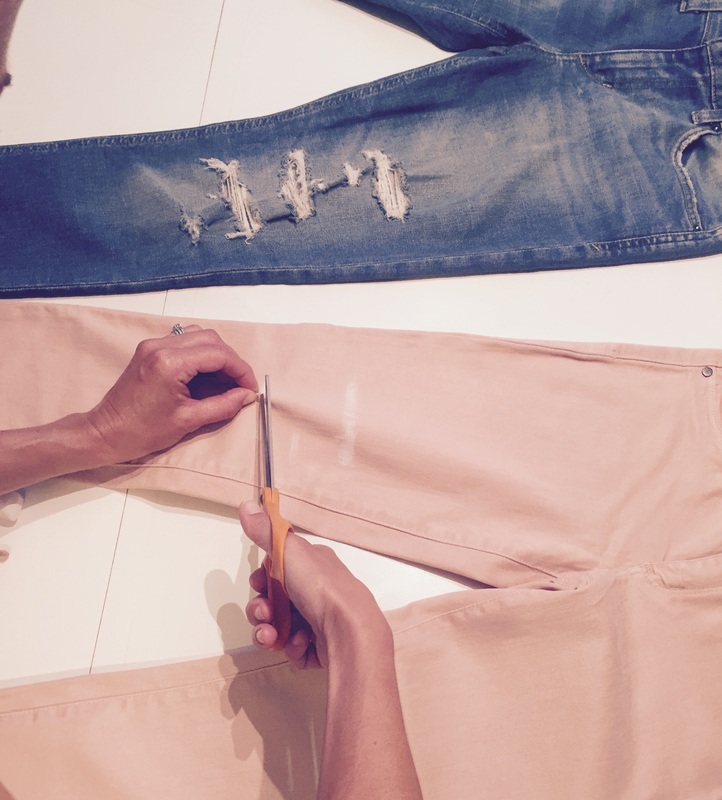 The more holes and slices the better; in every fit and every cut, distressing your jeans is a must this fall! 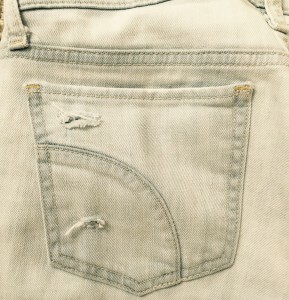 Think of it as ‘freedom of expression’ and go at your jeans with wild abandon. We all have that pair of old jeans that we haven’t pulled out of our closet in years. And I bet we all have that pair of jeans that we try on over and over again but never wear because there is something ‘not quite right’ about them. Just recently, I noticed that I had several pairs of jeans just like this in my closet. So, instead of making my usual trip to the local Good Will, I decided to distress them like crazy. The following are pictures and directions for the whole process from beginning to end. 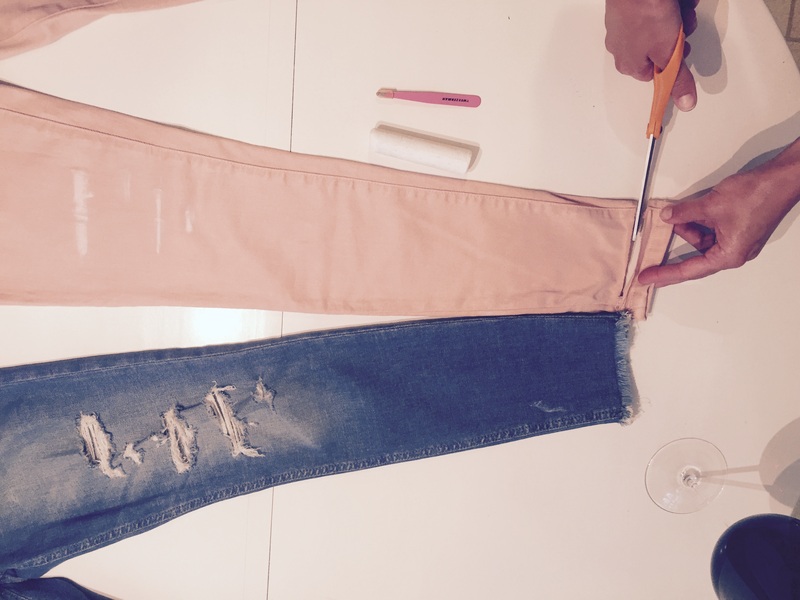 It’s easier than you think so grab a pair of scissors, tweezers, and some chalk and let’s get started! 2. Mark where you want to make your cuts (several cuts in a row will make a bigger hole). 3. Grab a little bit of fabric and hold it vertically in between your fingers. 4. HORIZONTALLY snip ever so slightly making a small incision. 5. Then, cut sideways horizontally towards each side (along the chalk line) until you’ve made the cut as wide as you want it. 6. 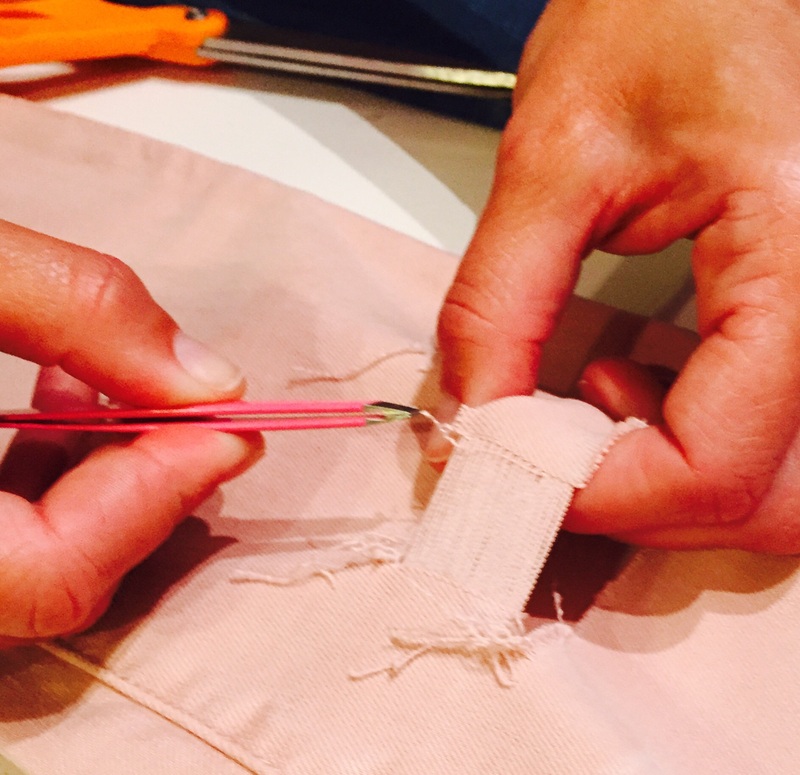 With tweezers, grab one of the VERTICAL fibers and pull (this first fiber will be the hardest to remove). 7. Keep pulling until all of the vertical fibers are removed, leaving only the horizontal fibers in place. Sometimes I leave a few vertical fibers in place (see below) because I like how it looks but you can decide as you go. 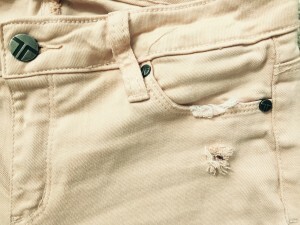 Tips: I always make a few extra small holes throughly the jeans to make them look ‘aged’ even more. To do this, just snip a small hole like you did in #4. Then, take your tweezers and roughen up the edges around the hole. It will end up looking like this. 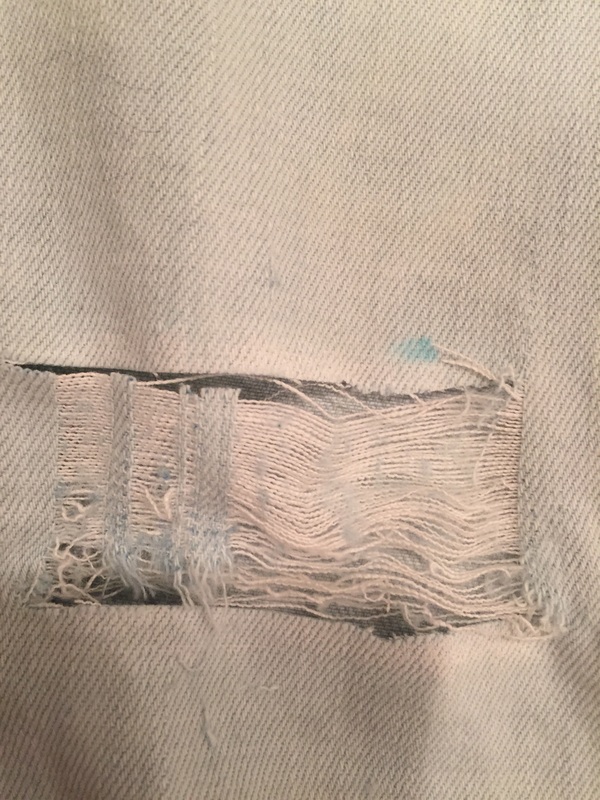 If you’re feeling overly ambitious you can also use the edge of the scissors to roughen up the edges of the pockets (cut seams of pockets first to start the aging process). 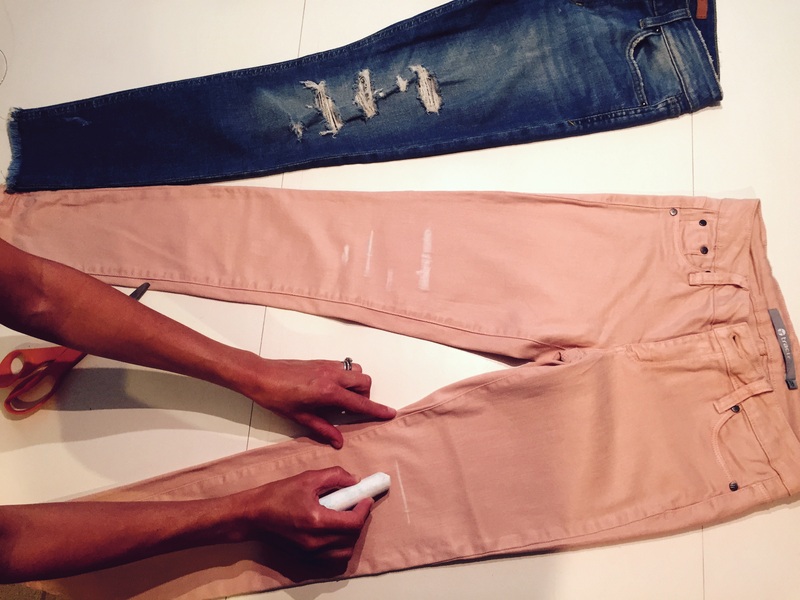 And if you really want to make your jeans extra distressed (think going all out with your creative expression), grab some sandpaper and go crazy throughout the legs of the jeans. 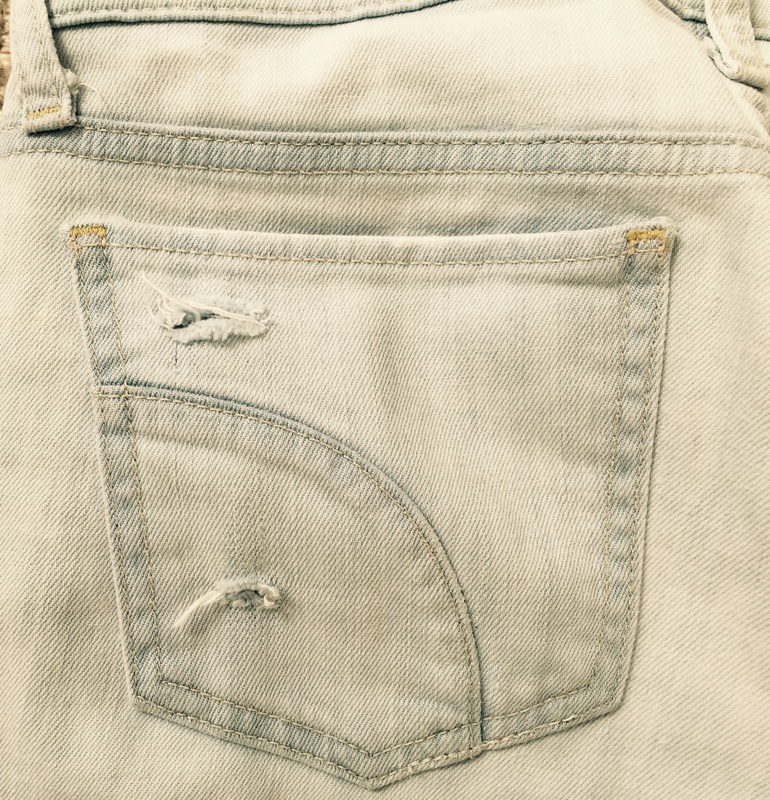 Trust me, you won’t be sorry you’ve destroyed your denim when you’re rocking them next weekend!